Believe it or not, my food journey began in middle school in Charleston, South Carolina. It didn’t begin with a delicious cake or an amazing feast, but rather with a class….a Latin 1 class. Yes, you read that correctly–I trace my culinary journey back to a Latin 1 class I took in 7th grade. The ancient Romans were known for some pretty awful-sounding foods. (For instance, garum, a common condiment in the ancient world, was made by fermenting fish intestines. The smell was so terrible that garum had to be made outside of the city walls.) So it’s safe to say that my inspiration did not come from the food of ancient Rome. Instead, my continued study of Latin provided me with the opportunity to travel to Italy in high school and then return to study in Italy for a semester in college. And that’s where my love of the culinary world really began! Italians love good food. There’s no way around it. Indeed, food plays a major role in most cultures, but there is something special about the Italian kitchen. 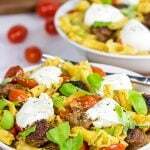 As a young kid, I thought Italian food consisted primarily of pizza and spaghetti and meatballs. I also thought Parmesan cheese only came in round canisters with a shake-top. Wow, was I wrong! On my first trip to Italy as a high school student, I was amazed by the various dishes and flavors that form the basis of authentic Italian food. In fact, that trip for me was as much a culinary journey as it was a tour of ancient sites of the Roman empire. From that point on, I knew I loved Italian food, but I still had no idea that food would eventually play such an important part in my life. When I returned to Italy in college, I had the opportunity to study at a center in Rome where a local family lived and cooked our daily meals. I finally had the opportunity to see a true Italian kitchen at work! On several occasions, the wife of the family invited us in to watch and learn the techniques behind Italian cooking. I remember learning how to make Potato Gnocchi from this wonderful Italian woman, and gnocchi remains one of my favorite Italian foods to this day! I left Rome with wonderful memories of the food and culture, but I also left with a copied packet of recipes from the wife who cooked our meals. It was my first food-related “textbook”! Can you guess where we are in this picture? It should come as no surprise to my readers that I married a good, Italian girl. She comes from a huge Italian family (seriously, she has more cousins than I ever thought possible), and the central dish at Christmas is not ham or turkey…but ravioli and meatballs. I love it! 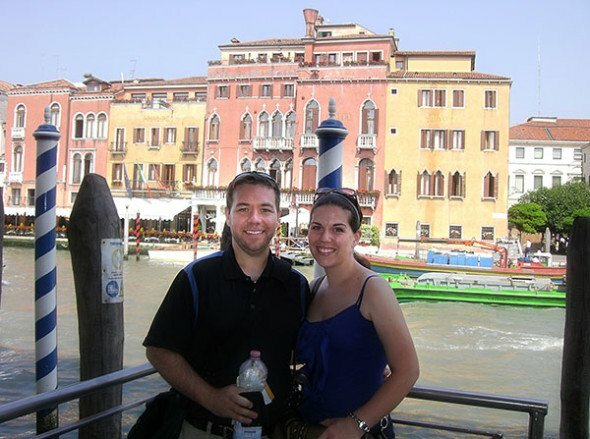 It should also come as no surprise that my wife and I decided to tour Italy for our honeymoon. We stayed in a number of different cities and had the opportunity to compare and contrast the cuisines of the various regions. Although they contain many of the same ingredients, the differences between northern Italian food and southern Italian food are amazing! (I guess the same is true in America, too, but as Americans, we are quick to put all Italian food into the same category.) One of my favorite things about eating in Italy was the prevalence of good quality Parmigiano Reggiano and quality olive oil. In fact, I think every meal included one or both of these! One of my favorite stops in Italy was Greve in Chianti, a small town about an hour outside of Florence. 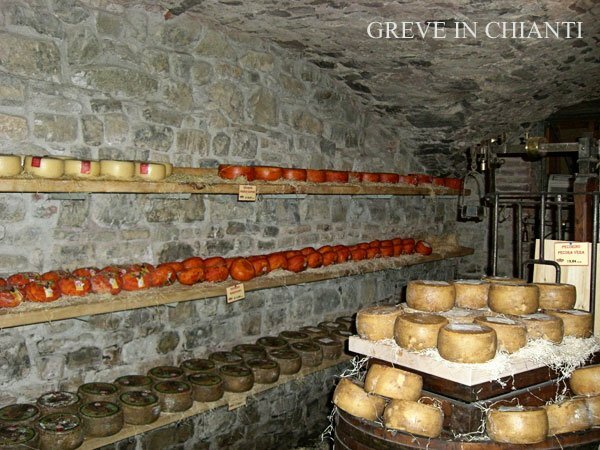 Aside from the delicious wine (Chianti of course), we had the opportunity to go into a small underground room where a local market aged their cheeses. The smell was certainly unique, but if that’s what it takes to make top-quality cheese, then I’m ok with it! 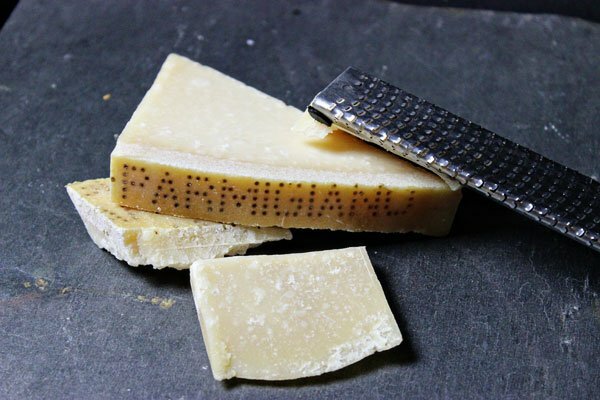 (Authentic Parmigiano Reggiano can only be made in the region around Parma, Italy…which is definitely on my itinerary for whenever I get back to Italy.) For our lunches in Greve, we simply paired bread (baked each morning by the local baker) with slices of this amazing cheese. Sometimes we added pieces of wild boar salame, which was equally amazing! 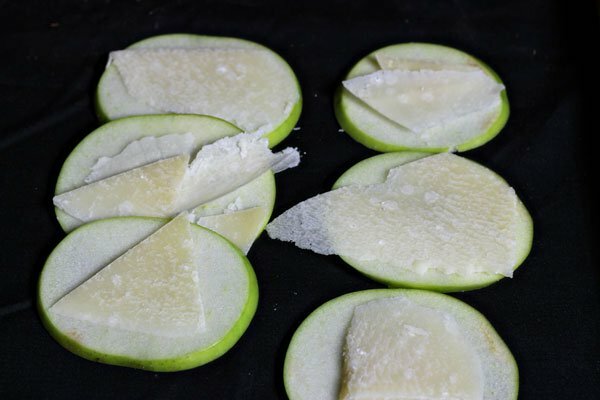 Pair quality parmigiano with sliced green apples! While I still haven’t found a source for wild boar salame in the U.S. (if you know of one, email me please! ), we are lucky that authentic Parmesan (i.e. Parmigiano Reggiano) can be found at most markets. 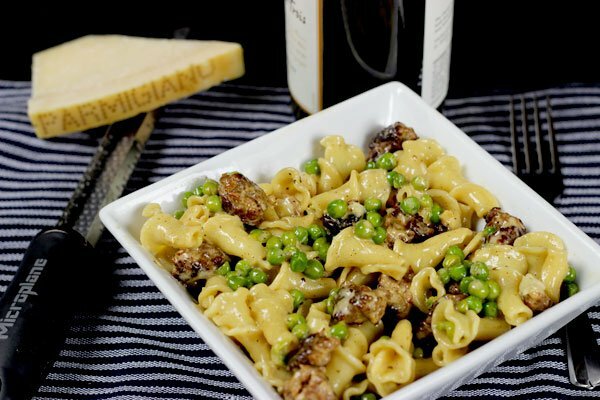 Today’s recipe features Parmigiano Reggiano and is one of my absolute favorite Italian meals. 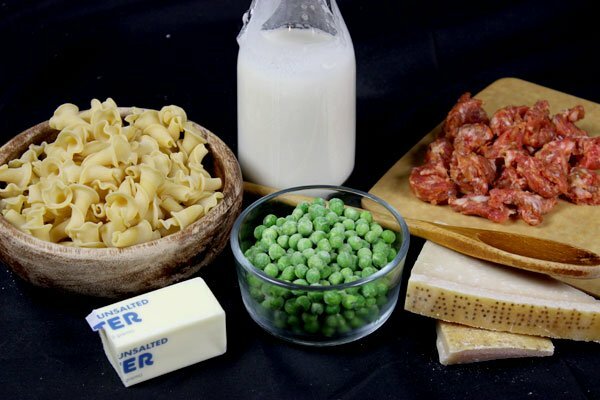 So grab some fresh Parmigiano Reggiano and a bottle of Chianti, and enjoy the wonder that is Italian food. Cheers! 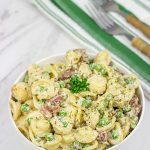 Break the bulk Italian sausage into small bite-size pieces. Transfer the sausage to a plate and pat dry to remove some of the grease. Once water is boiling, cook pasta to desired tenderness. When done, drain pasta, but reserve about 1/2 cup of the pasta water for later. Meanwhile, melt butter and olive oil in a large saute pan on medium heat. Add peas and chicken/vegetable stock and continue cooking on medium for another 3-4 minutes. Add heavy cream and cooked Italian sausage. 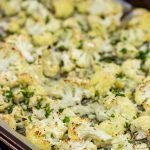 Reduce heat to a low simmer and cook for about 6-7 minutes. Remove from heat and add cooked pasta and Parmigiano Reggiano. Toss to coat and add small amount of pasta water to adjust thickness of sauce (if necessary). Top with freshly grated Parmigiano Reggiano and serve hot. Roasted garlic is often available in the bulk department at your local deli (with the olives). You can also roast your own garlic--stay tuned as I will be posting this technique soon! This looks amazing! Love Parmesan AND Whole Foods!